"Great polar bear... how do you survive on the thick ice covering the deep Arctic Sea?" Journey into the magnificent and mysterious world of the far north in Great Polar Bear, Carolyn Lesser's poetic and scientifically accurate story about a year in the life of a polar bear. Learn how this impressive animal thrives in one of the harshest -- and imperiled -- environments in the world. Carolyn Lesser also makes her illustrative debut in Great Polar Bear, using collage to capture the bear hunting, swimming, and playing in the far north. 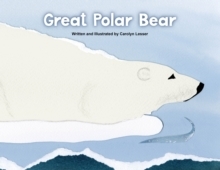 Great Polar Bear is a stunning one-on-one reading and sharing title. Originally published in 1996 as The Great Crystal Bear, this stunning edition features all-new artwork from the author. Praise for the previous edition (The Great Crystal Bear):"Lyrical in tone and accurate in zoological detail, the narrative is ideal for one-on-one sharing. "-School Library Journal"In a rolling, poetic text, Lesser wonders about the life of a polar bear....She weaves her gentle musings with solid scientific information, as the bear searches for food, traps and eats a seal, and play fights with younger bears to teach them how to battle for a mate.....for primary-graders, this would make an evocative addition to a unit on the Arctic. "-Booklist"Lesser weaves a surprising number of facts into a lyrical narrative about a year in the life of a polar bear. Readers learn how the bear's hollow white hairs gather sunlight while its black skin absorbs the heat, how it kills and eats and leaves behind meat for other, less able, animals. "-Kirkus Reviews"Great Crystal Bear is exciting, neat and fun to read.